Being part of the action is all well and good but, if your day-to-day life means contending with a packed schedule and a bustling city, sometimes the only way to unwind is to truly get away from it all. 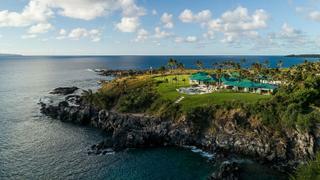 Located in remote destinations, these high-end properties offer utter seclusion and privacy without scrimping on luxury - click through to find your next vacation home investment... 9 Bay Drive, Hawaii Forgo the beautiful but busy Bahamas and find your perfect American escape with this incredible estate in Kapalua Bay, Hawaii. Previously owned by tech entrepreneur Craig Ramsey, founder and chairman of Vlocity, Inc and formerly of Salesforce and Oracle, the estate spans 20,000 square feet on Hawea Point and boasts incredible views across the bay to the neighbouring islands of Lanai and Molokai. The house itself is centred around a huge open-plan living, kitchen and dining space with floor-to-ceiling windows that can be retracted to offer unbroken views over the ocean. Accommodation is in eight bedrooms including a spa-style master suite with panoramic views and a large semi-alfresco bathroom while the seven further bedrooms feature a mixture of stylish in-room bathing options or outdoor showers. Living spaces are completed by a gym, billiards room, courtyard and media room while the well-kept lawns offer a large swimming pool. Set at the furthest end of Hawea Point and with enough grounds to ensure complete privacy, those looking for a bit more action will find the upscale Kapalua community close at hand offering a range of amenities including a number of fine dining restaurants and bars in the Ritz-Carlton Kapalua. 9 Bay Drive is listed for sale for $49 million with Island Sotheby's International Realty. Forgo the beautiful but busy Bahamas and find your perfect American escape with this incredible estate in Kapalua Bay, Hawaii. Previously owned by tech entrepreneur Craig Ramsey, founder and chairman of Vlocity, Inc and formerly of Salesforce and Oracle, the estate spans 20,000 square feet on Hawea Point and boasts incredible views across the bay to the neighbouring islands of Lanai and Molokai. The house itself is centred around a huge open-plan living, kitchen and dining space with floor-to-ceiling windows that can be retracted to offer unbroken views over the ocean. Accommodation is in eight bedrooms including a spa-style master suite with panoramic views and a large semi-alfresco bathroom while the seven further bedrooms feature a mixture of stylish in-room bathing options or outdoor showers. Living spaces are completed by a gym, billiards room, courtyard and media room while the well-kept lawns offer a large swimming pool. Set at the furthest end of Hawea Point and with enough grounds to ensure complete privacy, those looking for a bit more action will find the upscale Kapalua community close at hand offering a range of amenities including a number of fine dining restaurants and bars in the Ritz-Carlton Kapalua. 9 Bay Drive is listed for sale for $49 million with Island Sotheby's International Realty. The eco-friendly Villa Caju is set on the coast of Bahia, adjacent to the Atlantic Forest Biosphere, which has been recognised by UNESCO’s Man and the Biosphere Programme since 1993. The six-bedroom estate offers 10,000 square feet of living space and features modern steel and glass architecture which works in harmony with the surrounding landscape. Interior attractions include a master suite with a massage area and Japanese Ofuro bath, a spacious office overlooking the living room, a home theatre and an artist’s atelier located on the upper floor. The beachfront property also comes with 5,000 square feet of terraces and balconies, swimming pool, staff quarters, an outdoor kitchen, beach pergola, landscaped gardens and garage, which have all been carefully integrated so as not to damage native trees. 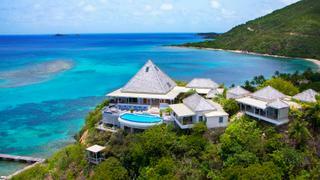 Villa Caju is listed for sale with Christie's International Real Estate for $3,000,000. The eco-friendly Villa Caju is set on the coast of Bahia, adjacent to the Atlantic Forest Biosphere, which has been recognised by UNESCO’s Man and the Biosphere Programme since 1993. The six-bedroom estate offers 10,000 square feet of living space and features modern steel and glass architecture which works in harmony with the surrounding landscape. Interior attractions include a master suite with a massage area and Japanese Ofuro bath, a spacious office overlooking the living room, a home theatre and an artist’s atelier located on the upper floor. The beachfront property also comes with 5,000 square feet of terraces and balconies, swimming pool, staff quarters, an outdoor kitchen, beach pergola, landscaped gardens and garage, which have all been carefully integrated so as not to damage native trees. 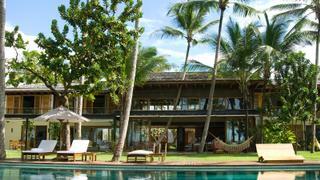 Villa Caju is listed for sale with Christie's International Real Estate for $3,000,000. This historic home is nestled between the Wicklow Mountains - less than 30 miles south of Dublin but practically hidden to outsiders thanks to its valley location. To reach Luggala, travellers would have to scramble to the top of the region’s highest peak before making their descent and it is this level of inaccessibility that lured the property’s original owner, Peter La Touche. Luggala's interior space spans 1,802 square metres, housing a total of 27 bedrooms and 18 bathrooms between the main house, guest lodge and seven estate lodges and cottages. Staying true to its eighteenth-century gothic influence, the property resembles a scaled-down castle with battlements and crochets, as well as pointed quatrefoil windows, vast reception rooms with ogee mantelpieces, original landscaped gardens and even a private beach. Luggala is listed for sale with Sotheby's International Realty for €28 million. This historic home is nestled between the Wicklow Mountains - less than 30 miles south of Dublin but practically hidden to outsiders thanks to its valley location. To reach Luggala, travellers would have to scramble to the top of the region’s highest peak before making their descent and it is this level of inaccessibility that lured the property’s original owner, Peter La Touche. Luggala's interior space spans 1,802 square metres, housing a total of 27 bedrooms and 18 bathrooms between the main house, guest lodge and seven estate lodges and cottages. Staying true to its eighteenth-century gothic influence, the property resembles a scaled-down castle with battlements and crochets, as well as pointed quatrefoil windows, vast reception rooms with ogee mantelpieces, original landscaped gardens and even a private beach. 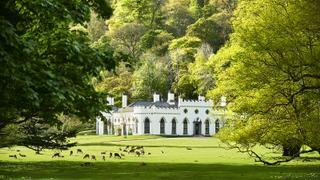 Luggala is listed for sale with Sotheby's International Realty for €28 million. Located 25 kilometres from Esquel city, this four-bedroom, four-bathroom family home is concealed amid the evergreen forests and jagged peaks of Chubut, Patagonia. Its private lakeside location makes it an ideal hub for fishing, swimming or boating while dotted across the 2,444 hectares of private land are the main home, guest house, chapel, marina and three caretaker's cabins. The grounds also feature a yacht mooring, swimming pool, sauna and garage. Recent modern improvements include two engine rooms to provide radiant under-floor heating, integrated audio systems and high-speed internet connectivity and the guest house has also been refurbished with solar panels and a gas-run generator. As an owner, you’ll be invited to help preserve the land’s ecological integrity under a Multiple Management Plan with the Forest Administration that hopes to continuously improve the quality of the native forest. The lakeside estate in Patagonia is listed for sale with Christie's International Real Estate for $9,000,000. Located 25 kilometres from Esquel city, this four-bedroom, four-bathroom family home is concealed amid the evergreen forests and jagged peaks of Chubut, Patagonia. Its private lakeside location makes it an ideal hub for fishing, swimming or boating while dotted across the 2,444 hectares of private land are the main home, guest house, chapel, marina and three caretaker's cabins. The grounds also feature a yacht mooring, swimming pool, sauna and garage. Recent modern improvements include two engine rooms to provide radiant under-floor heating, integrated audio systems and high-speed internet connectivity and the guest house has also been refurbished with solar panels and a gas-run generator. As an owner, you’ll be invited to help preserve the land’s ecological integrity under a Multiple Management Plan with the Forest Administration that hopes to continuously improve the quality of the native forest. 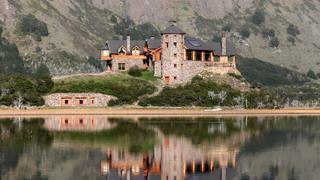 The lakeside estate in Patagonia is listed for sale with Christie's International Real Estate for $9,000,000. Against a backdrop of gravelly mountains lies this refuge on the edge of the Mexican desert. With 114.6 untouched acres of grounds, 200 palm trees, lawns and three vegetable gardens, Boulder Cove is a truly private oasis on the shores of the Sea of Cortez, which oceanographer Jacques Cousteau called “the world’s aquarium” owing to the rich biodiversity he discovered here. The constant sunshine and cove-setting make this an ideal abode for outdoor pursuits, where you can enjoy a range of activities from paddleboarding to kite surfing. The self-sufficient open-plan property boasts ten bedrooms, nine bathrooms, staff quarters, a private beach, swimming pool and helipad and comes with its own solar and desalination systems, garages, a boat with storage, two tractors and a workshop. Boulder Cove is listed for sale with Sotheby's International Realty for $9,450,000. Against a backdrop of gravelly mountains lies this refuge on the edge of the Mexican desert. With 114.6 untouched acres of grounds, 200 palm trees, lawns and three vegetable gardens, Boulder Cove is a truly private oasis on the shores of the Sea of Cortez, which oceanographer Jacques Cousteau called “the world’s aquarium” owing to the rich biodiversity he discovered here. The constant sunshine and cove-setting make this an ideal abode for outdoor pursuits, where you can enjoy a range of activities from paddleboarding to kite surfing. 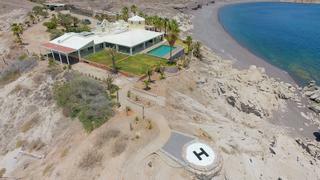 The self-sufficient open-plan property boasts ten bedrooms, nine bathrooms, staff quarters, a private beach, swimming pool and helipad and comes with its own solar and desalination systems, garages, a boat with storage, two tractors and a workshop. Boulder Cove is listed for sale with Sotheby's International Realty for $9,450,000. Situated on the west side of Virgin Gorda on an outcrop overlooking the Sir Francis Drake Channel, Katitche Point is sandwiched between Mahoe Bay, Savannah Bay and Pond Bay. Designed by British architect, Michael Helm, the property was completely renovated in 2014. The high ceilings and distinctive pyramid-shaped roofs often seen in the area are angled to provide natural ventilation while its expansive 857 square metres provides enough space for up to 12 people. Covered pathways lead the way to the Greathouse, which features an open-plan living, dining and kitchen area and four suites complete with private bathrooms and spacious verandas, while an adjoining wing houses the master suite with sitting area, porch, children's room and outdoor bath and shower. Outside the property also features numerous terraces, a koi pond, swimming pool and al fresco dining area. While it may feel like a world away from civilisation, Katitche Point is only a 20-minute drive from North Sound and a boat ride away from neighbouring islands. Katitche Point is listed for sale with Sotheby's International Realty for $2,800,000. Situated on the west side of Virgin Gorda on an outcrop overlooking the Sir Francis Drake Channel, Katitche Point is sandwiched between Mahoe Bay, Savannah Bay and Pond Bay. Designed by British architect, Michael Helm, the property was completely renovated in 2014. The high ceilings and distinctive pyramid-shaped roofs often seen in the area are angled to provide natural ventilation while its expansive 857 square metres provides enough space for up to 12 people. Covered pathways lead the way to the Greathouse, which features an open-plan living, dining and kitchen area and four suites complete with private bathrooms and spacious verandas, while an adjoining wing houses the master suite with sitting area, porch, children's room and outdoor bath and shower. Outside the property also features numerous terraces, a koi pond, swimming pool and al fresco dining area. While it may feel like a world away from civilisation, Katitche Point is only a 20-minute drive from North Sound and a boat ride away from neighbouring islands. Katitche Point is listed for sale with Sotheby's International Realty for $2,800,000.